What are the best rock shoes on the market? To find out, we reviewed a mix of over 20 top rated shoes, and compared them using our comparison metrics. We comprehensively evaluated these shoes to determine how they edge, how comfortable and sensitive they are, and how they perform in cracks and pockets. 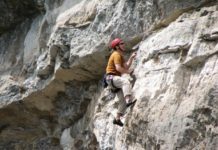 These tests were performed on crags from Washington to California, with additional information coming from reliable resources such as professional guides, veteran climbers, and experienced outdoor retailers. In this review, we detail how the best shoe performed in each test. 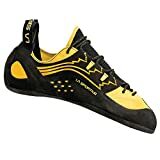 From the folks that first brought you down-turned shoes, the La Sportiva Genius is the product of multiple advancements in climbing shoe technology. More than just the evolution of the No Edge concept, the Genius borrows the best features from the La Sportiva arsenal for its design. The Genius is perfectly ready for a projecting session right out of the box and will stay that way until you finally wear through the toe. Use this model for sport clipping, bouldering, and high-end traditional climbing, the Genius will not disappoint. Though three shoes (the Katana Lace, Genius, and Futura) all tied for the highest score in our test, we have decided to grant the highest honor to the innovative Genius. If you aren’t ready to spend almost $200 on a pair of climbing shoes, then take a look at one of these other high-performance models. 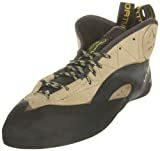 Best bang for the buck climbing shoes. 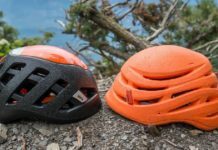 The folks at Mad Rock have accomplished their goal by creating an affordable, durable shoe that climbs well. 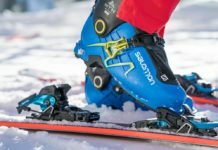 The Mad Rock Flash has the second lowest price of any shoe we reviewed and is by far the superior performer of the two. Of the budget shoes we reviewed, this is the one we would consider when climbing at or near our grade. It has great versatility of use, being equally appropriate for the gym and general outdoor climbing. The Flash is comfortable, and both easy to put on and take off. This shoe performed solidly everywhere we took it. A true all-rounder. The La Sportiva Katana Lace is one of our favorite shoes from the field tests. It ranked near the top in all assessed categories. The Katana Lace came closer to doing everything well than any shoe we have ever used. We used it on welded tuff and other volcanic rock, on granite sport and trad climbs, on limestone, and on sandstone. This shoe performed solidly everywhere we took it. As a true all arounder, it didn’t rank at the top of any category; instead, the Katana Lace wins this award for its incredible versatility. The La Sportiva TC Pro is a solid all-rounder that still excels as a multi-pitch trad climbing shoe. 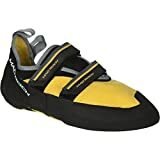 The La Sportiva TC Pro deserves attention for being a solid all-arounder that still excels as a multi-pitch trad climbing shoe. This shoe edges extremely well, letting you leave the crack systems behind and tackle some serious face climbing with confidence. When the climb brings you back to the cracks, the TC Pro handles them better than most. Not to mention this shoe provides some ankle protection because of the higher cuff. If you find yourself groveling up something wide, this shoe actually prevents you from getting ankle gobies. Every climber knows the importance of good climbing shoes. Shoes are probably the piece of gear that gets the most attention from climbers. There is a broader spectrum of products on the market these days than ever before, and there are more options all the time. 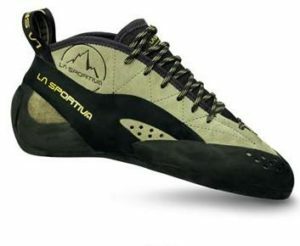 Some shoes are easily categorized, such as the La Sportiva Miura VS, because of their highly specialized function. 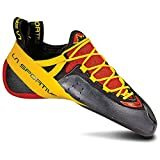 Others that are intended to perform decently on a variety of terrains, such as the La Sportiva Katana Lace or Five Ten Anasazi VCS, are a little harder to place in a specific category. Below we provide a basic break down of features commonly associated with each type of shoe. 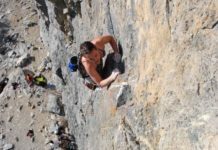 For starters, high-end specialized sport and bouldering shoes are typically gun-and-done shoes that you take off immediately after you finish climbing. While they shouldn’t be excruciating, they will likely be sufficiently uncomfortable that you won’t wear them while belaying. These shoes will typically have an aggressively downturned toe and be asymmetrical in shape. For a sport shoe you can wear all day, look for a flatter toe and more symmetrical design that is more naturally comfortable instead of just wearing a loosely fitting, aggressively shaped shoe. A shoe for crack climbing will typically have a flatter toe and symmetrical design. This makes them more comfortable for wedging into cracks and wearing for longer durations. These shoes can also be worn larger for comfort, or to allow room for socks if you’re going really high, or climbing with your grandpa. 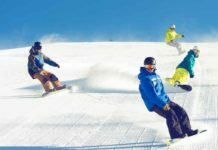 A slight downturn can still be comfortable on the really big days and will give you an edge in performance when it matters. Depending on how hard you go in the gym, your choice of shoes will vary widely. Again, a flatter toe and larger sizing will prove to be more comfortable (which is highly recommended for those just starting out), but for pushing your limits indoors, a tightly fitted aggressive shoe will go a long way. 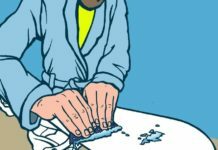 We tested several shoes reputed to have excellent edging capabilities. Among the models tested, the La Sportiva Genius, Katana Lace, La Sportiva Miura, Miura VS, and TC Pro ranked the highest in this category. Designed to bring the climbers toe into unparalleled contact with the rock, the La Sportiva Genius redefines the standard for performance shoes. Among more traditionally designed shoes, the Miura VS ranked very highly. 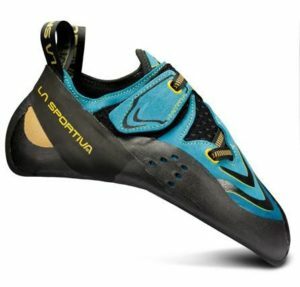 Worthy of the hype, the La Sportiva Genius provides unmatched sensitivity and a tremendous feeling of security even on the most insecure footholds. Though the Genius feels phenomenally precise, it doesn’t require perfect placement of your feet to work. The Genius will mold itself onto the thinnest holds, keeping you moving through the most tenuous sections of a climb. This is a tremendous advantage when on-sighting. The shape and sensitivity of the Genius will also allow you to refine the placement of a foothold without transferring your weight. This helps you to minimize movement making you more efficient and provides security by keeping you in contact with the rock. Let this take nothing away from the Sportiva Miura VS: it is an edging machine. La Sportiva has nailed it with this shoe. It is a fusion of the original Miura, a velcro system, and the pick of an ice climbing tool. The Miura VS stands on anything, and since it has a more traditional design, it will feel familiar, ready to go out of the box. For the Miura VS to really perform for you, you’ll have to size it tight. Expect it to be painful, this is a gun-and-done shoe that you take off as soon as you’ve sent your project. Hold it in reserve for the days when you’re really pushing your grade. For only a marginal sacrifice in edging performance and a significant increase in comfort and versatility, we recommend the TC Pro, Katana Lace, or Miura, but not necessarily in that order. These three shoes are solid all-rounders that perform well on a variety of terrain. Of the three, the Katana Lace ranks highest in overall versatility, performing well in all our evaluation criteria. We tested several shoes generally used for all-around climbing, and one specialized trad climbing shoe, the La Sportiva TC Pro. Our favorite crack climbing shoes were the TC Pro and Katana lace, both from La Sportiva. They are both comfortable out of the box and keep your foot in a relatively flat position, ideal for crack climbing. 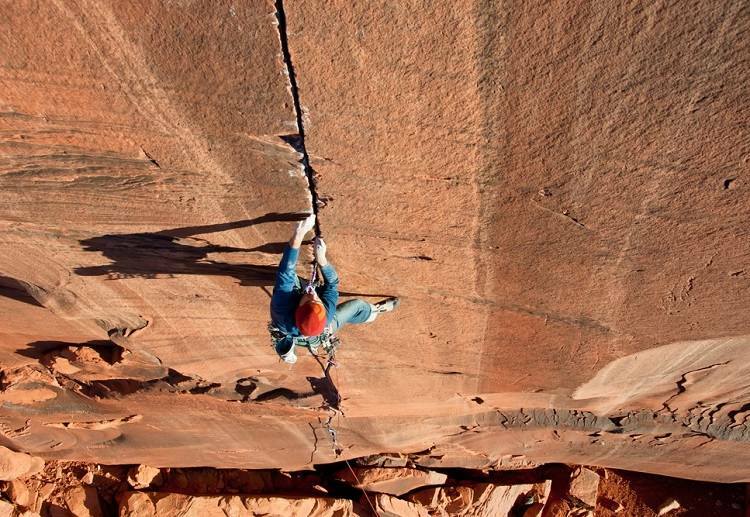 They have their individual strengths and excel at different styles of crack climbing. The TC Pro does well in all but the thinnest cracks. It feels precise, and the padding above the toe makes a noticeable difference when jamming. The TC Pro really thrives on the wide stuff, where the thin padding above the ankle offers excellent protection. The Katana Lace’s tech fit and medium asymmetry give it an advantage when cracks get thin and technical. In anything thinner than the ankle-chewing wide cracks, where the TC Pro thrives, the shoes ranked very similarly. Other shoes that ranked well in testing were the La Sportiva Miura and the Anasazi VCS – great alternatives if the Katana Lace or TC pro isn’t the right fit for your foot. 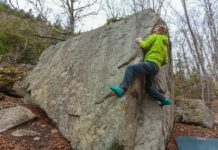 If you plan to climb sandstone splitters at Indian Creek for a month every spring and fall, you can’t do any better than the classic and comfy Five Ten Moccasym. The La Sportiva Miura VS and Genius go head-to-head again for the title of the best shoe in pockets. These shoes ranked very similarly, both performing exceptionally, and getting it done in spectacularly different style. Both shoes feature aggressively downturned toes, and a P3 (“Power, Performance, Platform”) midsole that helps them hold their shape. The Miura VS relies on pinpoint precision to really perform. Contrasted with the Genius the Miura VS felt blind on the rock. The Genius allowed us to climb more naturally, particularly on unfamiliar terrain. The other significant difference in the performance of these two shoes is their comfort. We were able to keep the Genius on between attempts at bouldering problems, and they let us hang out on sport climbing projects in comfort. While the Miura VS did provide an incentive (in the form of pain) to get through a climb, we’d opt for the comfort of the Genius any day. That being said, neither of these shoes are wear-all-day comfortable. For a shoe that you can wear on both long sport and traditionally protected routes, but that will still get it done on steep pocketed terrain, check out the La Sportiva Katana Lace. The Katana lace has a tech fit, meaning that it has a slightly downturned toe, but your foot remains fairly flat with a medium asymmetry. This compromise between a neutrally shaped climbing shoe and one with a much more aggressive shape creates a remarkably balanced shoe. The Genius is only rivaled only by the La Sportiva Futura as the most sensitive shoe we’ve ever tested. The most immediately recognizable benefit of the No Edge concept is how well you can feel the rock in the Genus or Futura. This shoe pastes itself onto blank faces better than many of the best edging shoes stuck to their edges. Sensitivity plays an enormous role in smearing. Both No-Edge concept shoes were able to move through low angle terrain as easily as the steep stuff. As a downturned shoe, this is a testament to the function of having a more sensitive shoe. An honorable mention goes to the Five Ten Team. While it didn’t rank very highly overall, it is impressively sensitive and sticky. 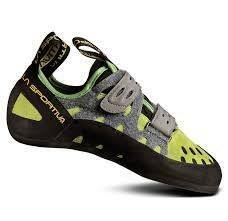 The comfort of a climbing shoe depends on how you size the shoe, your foot position, and the shoe’s material. The tighter the shoe, the better it will perform, the looser the shoe the worse it performs. However, tightness equals pain and looseness equal comfort. But, if your shoes are so tight you can’t put pressure on your toes, you may have reached the point of down-sizing where it is counterproductive. 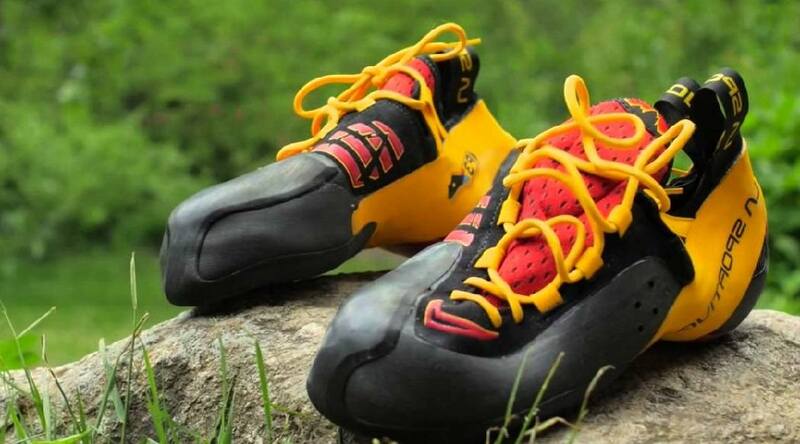 The La Sportiva Tarantula is a decent compromise between performance and comfort. This is a shoe designed with comfort in mind. Though not suitable for high-end climbing, the rounded shape, flat foot position, and higher volume fit of the shoe allows you to size the Tarantula tightly for performance without sacrificing comfort. The TC Pro and the Mad Rock Flash are flat shoes that have a much higher level of performance but are still quite comfortable. The TC Pro is an excellent choice for an all day shoe, particularly for long routes. The Mad Rock Flash is not the best performing shoe, but ranks higher than the La Sportiva Tarantula, and is very comfortable. A down-turned toe and asymmetrical shape typically mean a shoe is less comfortable, but a more aggressive shape also enhances performance in many aspects of climbing. With modern technology and design, climbing performance and comfort are no longer mutually exclusive concepts. The Katana Lace and Futura both offer comfort and performance at a very high level: The Katana is a very solid all-around performer, and the Futura is a high-end sport shoe. 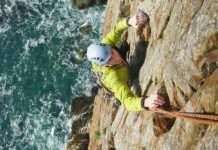 Having a durable and versatile climbing rope is important to the safety of all climbers. 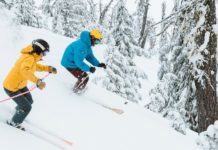 Two of our favorites are the Mammut Infinity and the Sterling Evolution Velocity. 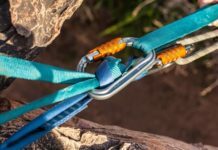 Check out The Best Rock Climbing Rope Review for a more in-depth look at all the ropes we reviewed. Every climber also needs a good chalk bag. We recommend the Prana Geo Chalk Bag and the Metolius Competition Chalk Bag. Reviews are subjective and everyone’s opinion is different. We have meticulously researched these shoes and talked to a lot of industry professionals that use and sell these shoes routinely. There are a bunch of great shoes out there, and in an expanding market, there is more all the time. Please let us know what you’d like to see them reviewed. Thanks!